Over the past year a number of Latin American elections resulted in victories for the right. What does this political change mean for the Palestinian cause? 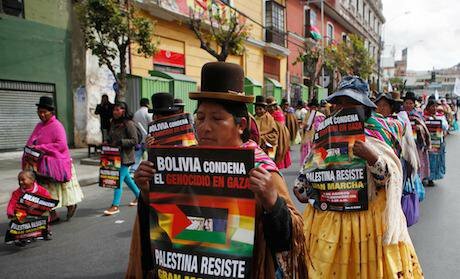 Aymara women march holding posters with a message that reads in Spanish; "Bolivia condemns genocide in Gaza. Palestine, resist" during a rally against Israel's offensive in Gaza, in La Paz, Bolivia, Friday, Aug. 8, 2014. Picture by Juan Karita AP/Press Association Images. All rights reserved. This past October, Chile’s political right won dozens of mayoralties in local elections, trouncing the governing center-left coalition. In the same month, the right-wing evangelical bishop Marcelo Crivella became the mayor of Rio de Janeiro. Over the past year, a number of other Latin American elections have similarly resulted in victories for the right, signaling that the “pink tide” of left-wing governments in the region is receding. This turn to the right does not bode well for the Palestinian cause, with such leaders as Crivella, whose first trip as mayor was to Jerusalem, openly supporting Israeli interests. This is a significant change from the recent past. While for decades Latin American governments were generally friendly toward Israel, this shifted in the 2000s when many of these governments, both progressive and less progressive, showed a stronger sense of solidarity with Palestine through such actions as recognition of a Palestinian state and condemnation of Israeli attacks on the Gaza Strip. Such solidarity marked a “golden decade” of Latin American-Palestinian relations. Yet at the same time, these official actions were largely symbolic, allowing the pursuit of Israeli material interests in Latin America to continue unabated. However, although recent political shifts are disheartening for those working for Palestinian rights, they are also setting the stage for grassroots movements, such as Boycott, Divestment, Sanctions (BDS), and local civil society groups to come together to push for the kinds of changes that were not possible even under more sympathetic left-wing governments. This policy brief traces the history of Latin American-Palestinian relations and then examines the role of Palestinian and Jewish diaspora lobbying in regard to the region’s political shifts. It ultimately assesses what is at stake for the Palestinian cause in Latin America and recommends potential avenues for action against Israeli efforts to push its agenda in violation of Palestinian rights. For decades, Latin America, with the exception of Cuba, was considered friendly to Israel . Latin American benevolence toward the Zionist project began in 1947, when regional diplomats supported UN Resolution 181, which called for the partition of Palestine into Jewish and Arab states. Thirteen of the 33 votes in favor came from Latin America. For the following two decades, Latin American government positions continued to be generally favorable toward Israel. Unlike African and Asian governments, Latin American governments during this period were by and large no longer concerned with the issue of decolonization, and as such were not especially interested in supporting the Palestinian cause. For instance, no Latin American country attended the Bandung Conference of 1955, and aside from Cuba, no Latin American country took part in the 1961 creation of the Non-Aligned Movement. Those were important platforms for Palestinian activists and intellectuals to affirm their solidarity with global liberation struggles and contest a Zionist narrative that portrayed Israel as part of the Third World. Indeed, in the wake of the 1967 Six-Day War, the PLO was able to strengthen ties with other anticolonial and anti-imperialist movements . In the mid-1970s, relations with Israel became more openly warm. Except for Brazil, all the conservative and/or authoritarian administrations – which comprised the majority of the region’s governments at the time – established strong ties with Israel through military assistance and/or development aid . Israel supplied the military dictatorships with weapons, military transport, intelligence equipment, counterinsurgency training, and even public relations consulting. With the end of the Cold War and the subsequent wave of democratizations, Latin American official rhetoric in regard to Israel and Palestine became more balanced, leading the region’s countries to normalize relations with both Israel and the Palestinians. The Oslo Accords reinforced this dynamic. However, this equidistance ultimately benefited Israel more than the Palestinians. In December 1991, for example, all Latin American countries except for Cuba voted to revoke UN Resolution 3379, which defines Zionism as a form of racism . Then, with the rise of more left-wing governments in the mid-2000s, a shift in policies toward Palestine began to take place. Latin American administrations after 2008 showed an unprecedented display of solidarity with the Palestinian people. The wave of recognitions of the state of Palestine between 2008 and 2013 marked the high point of this shift. With the exception of Mexico, Panama, and Colombia, every country in the region now officially recognizes Palestine as a state. Not only radical left governments, but also leftist and center-left administrations took part in this trend. Brazilian President Luis Inácio Lula da Silva and Dominican President Leonel Fernandez paid historic visits to the Occupied Palestinian Territory (OPT) in 2010 and 2011, respectively, while Argentina and Uruguay opened new embassies in Ramallah. In addition, as the international community remained silent during Israel’s 2014 assault, Brazil, Argentina, Chile, Peru, and Ecuador issued strong statements in condemnation and called their ambassadors home for consultation. Most recently, in 2015 Brazil’s Dilma Rousseff government rejected the appointment of Dani Dayan, a former leader in the Yesha Council – a committee representing Israeli settlements in the West Bank – as Israeli ambassador to Brasilia. Such governmental support also translated into financial donations and South-South technical cooperation. Venezuela, Chile, Bolivia, and Brazil raised their level of cooperation with Palestine. Since 2008, for instance, the Brazilian Cooperation Agency has run six projects in Palestine in such areas as health, sports, and media. Between 2006 and 2012, the amount that Brazil donated to successive international conferences, particularly for the reconstruction of Gaza, reached more than $30 million. The country also became UNRWA’s largest contributor among the BRICS. Though it is clear that leftist governments were keener to show solidarity with Palestinians through bolder and more vocal moves, right-wing governments also took part in the trend. The administrations of Sebastian Piñera in Chile, Otto Pérez Molina in Guatemala, and Porfirio Lobo in Honduras were part of the wave of official recognitions of the Palestinian state. Piñera even paid a visit to the OPT in 2011 . However, not long after these developments, right-wing governments began to win elections in Latin America and declare their support for Israel. A variety of factors are causing this political shift, including corruption scandals among left-wing ruling parties and a regional economic crisis. While international issues are not a core element of the shift, the “golden decade” of Latin American-Palestinian relations has become a symbol of what the right denounces as “ideological” foreign policy. After 12 years of a left-wing Kirchnerist government, in November 2015 Argentina was the first country to shift toward the center right by giving a presidential victory to conservative Buenos Aires mayor Mauricio Macri. Less than a month later, the United Socialist Party of Venezuela, the political force that supported the Bolivarian revolution led by President Hugo Chávez until his death in 2013, and that is now carried on by his successor, Nicolas Maduro, suffered a major loss in the parliamentary elections. Today, the future of Maduro’s government is uncertain. In Brazil, the controversial impeachment of Dilma Rousseff in 2016 ended the 13-year rule of the Workers’ Party. Vice President Michel Temer, the leader of the Brazilian Democratic Movement Party, became interim president and allied with right-wing parties to form his cabinet. A few months later, the Workers’ Party lost more than half of the 644 municipalities it had secured in 2012. Another shift occurred in Peru, where Pedro Pablo Kuczynski, an ex-Wall Street financier, won the presidential run-off in June 2016, while Veronika Mendoza, the candidate of the Broad Left Front, came in third during the first round of voting. In 2011, left-wing candidate Ollanta Humala and his alliance had won both the presidency and the highest number of congressional seats. Right-wing leaders seized the issue of Palestine as a symbol of their shift in international alliances. This was especially true in Argentina. In June 2014, Macri, then still mayor of Buenos Aires, participated in an international mayors’ conference in Jerusalem. Macri took the opportunity to tell Israeli Prime Minister Benjamin Netanyahu that if he won the presidency, Argentina’s treatment of Israel would change for the better and that cooperation between the two countries would improve. No sooner was he elected did President Macri begin to deliver on his promises. In January 2016, he met with Netanyahu at the World Economic Forum in Davos, where they agreed to increase investments in technology, security, defense, and food. No other country in the region witnessed such a quick and radical change in attitude toward Israel and Palestine. Yet there are clear signs pointing in this direction in other countries. Less than a month after being appointed Brazil’s foreign minister in May 2016, José Serra, a former governor of São Paulo known for his longstanding relations with pro-Israel Brazilian-Jewish organizations and Israeli officials, announced that the country would reconsider its recent favorable vote for the UNESCO resolution on Jerusalem, which urges Israel to stop “aggressions and illegal measures against the freedom of worship and Muslims’ access to their holy sites.” While Brazil ended up retaining its vote, its representative indicated that it was unlikely to support such resolutions in the future. Latin America is home to an estimated half a million Jews, of which more than 80% live in Argentina. Around 120,000 Jews live in Brazil. Zionist organizations in the region were created in the 1920s and have played a crucial role in structuring and influencing these communities, some of whose members have been represented among the local economic and political elite. Like in any region, the Latin America Jewish diaspora is not uniform. Though the majority of Jewish institutions has always maintained close ties with Israel, important dissident, leftist voices, many of whom were Trotskyists, were able to make themselves heard. However, since the second intifada, strict alignment with Israel has become mainstream. Major Jewish organizations play an active role in supporting the Israeli government and its policies, mainly by undertaking public diplomacy through personal contacts and media interviews. They also often organize and sponsor tours to Israel for journalists and members of their parliaments as a way to disseminate Israel’s narratives about Palestine . The region is also home to a large Arab presence, principally Syrian-Lebanese. Some observers believe that 5% of the Latin America population is Arab in origin, which corresponds to approximately 25-30 million people. Though reliable numbers are hard to come by, it is clear that the largest Syrian and Lebanese communities are in Brazil, Argentina, Venezuela, and Mexico. The Palestinian diaspora’s population is roughly equivalent to the number of Latin American Jews. It is predominantly found in two countries: Chile, with 350,000 Palestinians, and Honduras, with 120,000. Many Latin Americans of Syrian-Lebanese and Palestinian descent, like Latin American Jews, are upper class, and thus frequent the same elite neighborhoods, universities, and social clubs. This upper-class segment of the Arab and Jewish diasporas tends to support right-wing parties. Because the struggle for Palestinian rights has been associated with leftist movements and, until the 1980s, with guerrillas, class interests and political affiliation have often estranged these wealthy Latin Americans of Arab descent from the Palestinian cause . Though other segments of this diaspora, mainly from the middle classes, have taken more of a role in defending Palestinian rights, the lack of unity in the community contrasts with the Latin American Jewish diaspora, for whom Zionism represents the tie that binds it together. Measuring the influence of diasporic lobbies on Latin American foreign policies is not easy; only a handful of empirical studies has been conducted on this topic. Nevertheless, it seems safe to say that neither Palestinian nor Zionist lobbying can solely explain a foreign policy orientation. This is not to deny the importance of diasporic lobbying, but to point out that its effectiveness depends on the accumulation of converging factors. Overall, such lobbying can tip a political decision one way or the other, but it is never the main driver. For example, the vote in favor of partition in 1947 was the result of an alignment with the United States and a sympathy for Zionism after the horrors of World War II, as well as the persuasiveness of a Zionist diplomacy that relied on local Jewish communities to convince Latin American leaders. By contrast, Arab lobbying in favor of Palestinian rights was relatively weak until the 2000s. Though in the late 1970s and 1980s the PLO raised awareness of the Palestinian cause among Latin American youth of Palestinian descent, the authoritarian contexts that characterized most of the region’s countries at the time restricted pro-Palestinian political mobilization and outreach. Democratization processes in the 1990s lifted those restrictions, but by then the disengagement of the PLO, busy with the promise of a hypothetical state-building project, prevented the establishment of a more vocal pro-Palestinian movement in Latin America. The failure and disappointment of Oslo and the outbreak of the second intifada in September 2000 spurred pro-Palestinian organizations to action. The intifada also particularly resonated with the diaspora due to the internet; finally, Latin Americans of Palestinian origin had live access to what was happening in Palestine without the filter of Western media. And while many transnational family ties had been lost over time, online media and social networks were instrumental in reconnecting this Palestinian diaspora with Palestinian society. The diplomatic status awarded the PA through Oslo also had a mobilizing effect. Local authorities’ official recognition of the PA enabled some conservative members of the Latin American Palestinian diaspora to support a cause that had been previously labeled as linked to “international terrorism.” Due to these developments, Palestinian lobbying became more informed, articulated, and persuasive – and helped Palestinian organizations leverage their influence in the political sphere. A case in point is Chile. The creation or reactivation of organizations such as Fundación Palestina Belen 2000, Federación Palestina, and the General Union of Palestinian Students enabled political activities in favor of Palestine. The Chile-Palestine Inter-Parliamentary Group, a coalition of MPs from both left- and right-wing parties, provided support as well . This wider pro-Palestinian network includes wealthy businesspeople, students, activists, and politicians. It has worked in cooperation with the Chilean government and its institutions. For instance, a number of Palestine solidarity organizations recently invited the West Bank’s Hanan Al-Hroub, who in 2016 won the Global Teacher Prize, to Chile, where she was received by President Michelle Bachelet. These Chilean groups approach their work with different ideologies. Though such heterogeneity is to be expected, it can blur the political message of the Palestinian struggle and sometimes impede successful results. In contrast, in Chile as in the rest of Latin America, the Zionist Jewish lobby is more unified in its message and activities. Thus, though the 2000s saw an increase in effective Latin American activism for Palestinian rights, better strategies must be implemented – particularly in the face of the renewed resurgence of the right. On the governmental and diplomatic level, the coming decade looks bleak for Palestinian-Latin American relations. However, a more critical look at the “golden decade” shows that there were always obstacles to the pro-Palestinian movement as it interfaced with Latin American administrations. Armed with strategies for combating these obstacles, the movement can and should rely on other resources and alliances to further its cause. Even when Latin American left-wing governments were making gestures in favor of Palestinian rights, Israeli material interests were not threatened. For example, Israel and Mercosur (the South America regional bloc that includes Argentina, Brazil, Uruguay, and Paraguay) negotiated and entered into a free trade agreement in April 2010. There has since been a significant rise in Israeli exports to Mercosur, from $807 million in 2009 to $1.3 billion in 2012 . Brazil is now Israel’s first export destination in Latin America, totaling one third of all Israeli exports to the region. Rio Grande do Sul Governor Tarso Genro, a prominent figure in the Workers’ Party, signed a research cooperation deal in April 2013 that made Elbit Systems the first Israeli military company to lead a Brazilian military project. It was also under the rule of the Workers’ Party that in 2014 Israeli security companies won nearly $307 million in military contracts with the Brazilian Armed Forces. Further, Buenos Aires Governor Daniel Scioli, the candidate of the ruling left-wing Front for Victory party in the presidential election of 2015, signed a deal with Mekorot and Ashtrom BV (a Dutch-Israeli firm) for the construction of a regional water treatment plant in La Plata. This strengthening of economic relationships has helped facilitate or at least ease the swing to the right today. Such activities can only be challenged by Palestinian communities, social movements, and grassroots campaigns that remind their governments of their responsibilities regarding human rights. In this sense, the BDS movement is raising awareness. In 2014, for example, Buenos Aires suspended the $170 million water treatment plant contract with Mekorot due to pressure from BDS activists, the Argentine Workers’ Central Union, and social movements, who argued that Mekorot was attempting to export the discriminatory water policies it uses against the Palestinian people. Another major victory in Latin America was the cancellation of the deal with Elbit Systems in the wake of protests over Elbit’s role in the construction of Israel’s separation wall and its close relationship with the Israeli military. By contrast, the academic boycott is in its early stages. A Latin American university or major academic association has yet to cut relations with Israel. Several initiatives, however, are underway. In January 2016, over 200 Brazilian intellectuals signed a letter calling for the academic boycott of Israel. In Argentina, a similar list includes more than 400 scholars. In Chile in April, 64 percent of students at the University of Chile voted in favor of cutting institutional links with Israeli universities, and 56 percent opposed activities involving representatives of the state of Israel. In September, the student federation of the Pontifical Catholic University of Chile voted for the university to end two cooperation agreements with Hebrew University of Jerusalem and the Technion - Israel Institute of Technology. In both cases, students of Palestinian descent played a key role in the mobilization. There is clearly a great deal left to be done, but the BDS movement is on the right path. It is crucial to strengthen Latin America’s pro-Palestinian movement at the grassroots level. This is not only because the region’s turn to the right is depriving it of its allies at the government level, but also because it can challenge Israel’s economic interests in the region – something that even leftist governments have not done. The BDS movement can continue to focus particularly on the boycott of the Israeli defense industry, including private security companies. While Latin America ranks only fourth in such imports, behind the Asia-Pacific region, Europe, and North America, the sector is highly symbolic, as its presence in Latin America traces back to the years of authoritarian rule. In addition, in Brazil, the Israeli defense industry is involved in training and equipping the military police, which has been accused of such human rights violations as killing and torturing detainees. Young black men from favelas and marginalized communities are at particular risk. The security forces also often use excessive force to suppress protests. Pro-Palestinian movements can strengthen their partnerships with human rights organizations and grassroots and victims’ organizations combating police brutality to denounce this Israeli-Brazilian connection based on racism and police violence. An illustration of such solidarity can be found in Rio de Janeiro. The Israeli company International Security and Defense Systems (ISDS) trains police in the favelas with the same techniques used in Gaza. It secured a contract with the 2016 Olympic Games in Rio. Palestinian movements such as Stop the Wall and the BDS National Committee joined forces with movements in Rio working for human rights in the favelas in a campaign dubbed “Olympics without Apartheid” to cancel the contract. The deal is still in place, and the campaign against ISDS’s presence in Rio de Janeiro continues. At a time when pro-Palestine movements are losing access to governments, including defense ministries, it would be naive to think that military embargo campaigns will make a radical difference in the short term. Yet passively waiting for the return of a more favorable political configuration is not an option. Electoral cycles in Latin America consist of four years. It is crucial for the pro-Palestine movement to begin to put its strategic priorities on the agenda of left-wing parties. This can help avoid in the future another round of symbolic gestures that satisfy Palestinian diplomatic representatives but are often disconnected from real Palestinian demands. Some might argue that those working for Palestinian rights can take advantage of the Arab diaspora’s ties with right-wing elites as a way to reach out to current governments. This, however, is not likely to produce results. The right’s impediments to Palestinian interests, such as its links to the military and, increasingly, the Evangelical church, are too numerous to allow a promotion of Palestine as a real bipartisan issue. This does not mean that right-wing politicians cannot back specific demands, but that activists should bear in mind that such targeted support will remain limited. The Palestinian diaspora – both on an organizational and individual level – has an important role to play in the quest for Palestinian human rights and self-determination. Latin Americans of Palestinian descent are best able to raise awareness in their respective societies about the current reality in Palestine. To accomplish this, they need to work beyond their ethnic networks and build stronger ties with local social movements. Bringing Hanan Al-Hroub to Chile to meet with the Palestinian community as well as high-level Chilean officials was an excellent initiative, for example, but it would have been even more effective to introduce her work to grassroots education movements so as to forge long-lasting bonds between Palestinian and Chilean society. Kaufman, Edy, Yoram Shapira, and Joel Barromi, Israeli-Latin American Relations (New Brunswick, NJ: Transaction Publishers, 1979), 94. Chamberlin, Paul Thomas, The Global Offensive: The United States, The Palestine Liberation Organization, and the Making of the Post-Cold War Order (New York: Oxford University Press, 2012). In addition, with its idea that armed struggle is the most effective means of achieving national liberation, the PLO found positive reception among Latin American guerillas. Cuba and Nicaragua, due to its Sandinista Revolution of 1979, were then pivotal in connecting the PLO with leftist movements all over Latin America. (Fernandez, Damian J., ed., Central America and the Middle East: The Internationalization of the Crises (Miami: International University Press, 1990). In 1988, Cuba and Nicaragua were the only countries in the region to officially recognize Palestine as a state. Bahbah, Bishara A. and Linda Butler, Israel and Latin America: The Military Connection (London: Palgrave Macmillan, 1986). The fact that Honduras and Chile are the two Latin American countries with the largest Palestinian communities – a significant contingent of which identifies with right-wing parties – contributed to this diplomatic move. These organizations include CONIB (Confederação Israelita do Brasil), AMIA (Asociación Mutual Israelita Argentina) and DAIA (Delegación de Asociaciones Israelitas Argentinas), and CJCh (Comunidad Judía de Chile). Class is not the only element at play. Lebanese Maronites, who make up a significant portion of the upper class of the Latin American Arab diaspora, have experienced, as a result of the Lebanese civil war, a process of long-distance nationalism that has dissociated them from the Palestinian cause. Such dissonances help to clarify why the majority of the wealthiest Latin Americans of Arab descent do not defend Palestinian rights. For example, neither Miguel Facusse Barjum, a Honduran tycoon who passed away in 2015, nor Alvaro Saieh Bendeck, a Chilean billionaire, publicly supported Palestine in spite of their Palestinian roots. Occasionally, such figures even disregard Palestinian rights. A Lebanese-Brazilian family business, for instance – the Grupo MCassab and the Cutait family – owns the exclusive importer of Sodastream to Brazil. With 48 out of a total of 120 members in the House of Deputies, it is currently the largest of the bi-national friendship groups. Eight members of the group are of Arab origin, among which are six of Palestinian descent. Two senators also have Palestinian roots. See the United Nations Comtrade Database. This article was first published by Al-Shabaka on January 10, 2017.